It’s been close to a week since I mentioned the issue of glutamate and excitotoxins. I’ve noticed that there has been improvement, but with my health issues (ongoing Epstein-Barr virus or EBV), MTHFR, etc., progress appears slowly. I have noticed though that as I cut back on foods with high amounts of natural glutamate, there is less brain fog and even less ringing in my ears. I’ve noticed (looking back), that there were times when my ears rang like a freight train and I assume it was after eating things that were high in glutamate. I could be wrong, but it seems that there’s a correlation. Foods that are high in glutamate are what is referred to as “bound” amino acids as opposed to “free” amino acids. This means that our bodies take time to break down the “bound” glutamate whereas the “free” glutamate goes directly into our blood streams without needing to be broken down at all. So clearly, it is best to avoid as many “free” forms of glutamate as possible over and above the naturally occurring “bound” glutamate in natural (not processed) foods, like tomatoes, brussel sprouts, etc. Again, in my case, due to my MTHFR genetic issue where I cannot process Folic Acid and therefore must use a methylated form of it, as well as the constant threat of my EBV recurring, it is important for me to remove from my diet the things that might cause harm. I’m hopeful that this will be the final piece of the puzzle that I’ve been journeying through for the past six years or so. 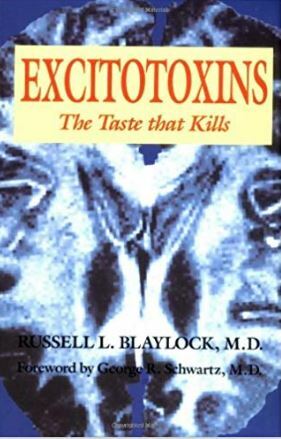 A book I’ve just begun reading and absorbing is called Excitotoxins The Taste That Kills by Dr. Russell L. Blaylock. It’s remarkable what he points out that apparently, the FDA completely ignored. Most of it has to do with the fact that way back in the 40’s/50’s, food companies took what Asians had used to amplify the taste in food and filtered it down to one particular ingredient: MSG. This MSG was liberally added to most food products from that point onward, in spite of research that highlights the dangerous potential and problematic response in our bodies to the presence of MSG. Recall that “excitotoxins” are chemicals which cause neurons in our brain to fire in an excited manner. Often, those neurons simply die of “exhaustion.” MSG does this so how is that a good thing? Over the years, MSG has been disguised, which tells me that the food companies know exactly how bad MSG can be for our systems. In attempting to disguise it, they become complicit in the decay and ongoing detriment that MSG has on human beings, especially our brains. It is really despicable but food companies are in existence to make money. The goal is to sell their product and if something like MSG not only enhances flavor but also creates a taste addiction, then people will come back again and again to buy Big Foods’ products. As I’ve said before, when people start experiencing terrible symptoms because of the additives placed in processed foods, Big Pharma is right there to provide relief…of symptoms. Rarely, is there a cure. But just think…if people eliminated the things in their diet that are harmful to them, we would not need Big Pharma to the extent that we do now. Instead, people continuing eating the processed foods that they know and love and wonder why they need to have their gall bladders removed, or why they have trouble thinking or losing their balance or any number of maladies that studies have shown can be directly related to the consumption of MSG in so many processed foods. As Dr. Blaylock points out, low-fat foods are nearly tasteless. Who wants that? So MSG and other chemical derivatives are added to these bland, tasteless foods to make them far more appetizing. This taste sensation is enough to make people think that what they’re eating is great food! Each food company (including fast food companies), have their own labs where people constantly taste test foods and new creations. Only those foods that pass the taste sensation test ultimately make it to market. More often than not, these foods are pumped with chemicals that serve only to enhance the taste, covering aspects of it that may actually be harmful to ourselves and this is aside from the chemicals themselves. Unblind My Mind dot org has some excellent information on this subject. In fact, if you dare, here is their list of the many ways free glutamate (or MSG) is labeled in processed foods. I encourage you to go to this link and download it. Print it out and keep it in your wallet so when you’re at the store next time, you can read labels and judge for yourself. What is annoying is that you’ll note terms like “natural flavoring” or even “spices” that are essentially code for “MSG.” I called one company that makes organic sausage – Jones Dairy Farm. My wife and I found them at Sprouts. Because there were only a few ingredients and they were organic, we decided to give them a try. It was after I had purchased them and tried them that I learned of how MSG is hidden in many products. Looks innocuous. I was concerned, so I called the company and the first woman I spoke with understood completely what I was talking about and my concern about MSG. She told me they do not use any form of MSG and told me the four spices that they included in their product – all of which were perfectly fine. I then asked about their sugar and where it was sourced from for their sausage. She could not answer that question but referred me to someone else whom she said could. I had to leave a message, but she returned my call informing me that they used pure cane sugar. So I was relieved to learn that the sugar was not from sugar beets or something else. In the end, I’m glad I made the call because it confirmed to me that I can continue to eat these sausage and I’ll also check into other products they produce and sell. Here’s my goal: I want to be as healthy as possible until the time the Lord calls me home. All around me, I see people who don’t even think about what they’re eating! They eat out all the time, they fill their grocery carts with some of the worst garbage that I used to eat! In essence, people have handed over their trust unreservedly to Big Food companies and Big Pharma. Does that not concern you at least for yourself? I’ve seen too many people die of brain-related causes like Dementia, Parkinson’s, Alzheimer’s and many others. It is in part due to the fact that what we eat is killing parts of our brains? That is the conclusion of Dr. Blaylock and numerous others. They have the research to back up their claims but the FDA is not interested. That is concerning. People, we must approach life as a gift from God. He did not say to treat our bodies as temples of the Holy Spirit for nothing. I believe this includes the foods we eat and what we drink. As Christians especially, I believe we have an obligation to eat the type of foods that create health and keep us healthy. Chowing down on processed foods because it is easier is not the best option. I also realize that eating healthy foods is more expensive and it is designed to be that way to keep people coming back to the Big Foods companies and the products they produce. However, this is not the best option. My wife and I have found that we eat our far less than we used to do simply because we cannot trust that chemicals (with MSG being the biggest one), are not added to the foods we eat at restaurants. Aside from this, with some of my food allergies (dairy, etc. ), it becomes a bit like playing Russian Roulette with my food. The money we save on not going out is put into the foods we buy at grocery stores; gluten-free, organic, free of MSG, etc., and to us it is very much worth it. The harm that is likely being done to us in the name of “food” is disgusting. We need to exercise caution and use wisdom and discernment. It’s not like experts have not warned us either but to remain willfully oblivious to the truth is not an excuse that flies, especially when you develop brain issues that cannot be cured but only “treated” with drugs (chemicals) that often have terrible side effects. I will continue to update my health and I do so to help others see that if a fat, obese guy who used to weigh 255 pounds several years ago now weighs 165 (and dropping), then you can too. It’s not easy and you’ll have to be willing to give up things that are harmful to you (though they taste superb!). Christians, we owe it to ourselves and God to eat healthy foods so that we can actually be in good health. I no longer take blood pressure medication. I no longer use a CPAP machine. Slowly, my brain fog and lack of clear thinking is evaporating. Had I not made major eating/lifestyle changes, there’s a good chance my health would’ve deteriorated to the point of needing to be on MORE meds, and I would’ve developed congestive heart failure. My appointment with death would likely have been the same time as it is now. However, my quality of life would’ve suffered greatly until that appointment. Now, it appears that because of my renewed health, I’m simply moving toward my appointment with death in a healthy way. I would encourage everyone reading this to give it serious thought. The quality of your life depends upon it. Entry filed under: Agenda 21, Religious - Christian - End Times, Religious - Christian - Prophecy, Religious - Christian - Theology, salvation. Tags: excitotoxins.